Posted Dec 08, 2018 by Eds. People pay taxes willingly when they are getting something for it. But not when the things they are used to are being taken away. The tax evaders are the super-rich and the big corporations with their batteries of lawyers and safe havens, or intruders like Amazon and Google, but ordinary French people have been relatively disciplined in paying taxes in return for excellent public services: optimum health care, first class public transport, rapid and efficient postal service, free university education. But all that is under assault from the reign of financial capital called “neo-liberalism” here. In rural areas, more and more post offices, schools and hospitals are shut down, unprofitable train service is discontinued as “free competition” is introduced following European Union directives–measures which oblige people to drive their cars more than ever. Especially when huge shopping centers drain small towns of their traditional shops. And the tax announced by the government–an additional 6.6 cents per liter for diesel and an additional 2.9 centers per liter of gasoline–are only the first steps in a series of planned increases over the next years. The measures are supposed to incite people to drive less or even better, to scrap their old vehicles and buy nice new electric cars. The most promising alternative sources of energy in France are the strong tides along northern coasts. But last July, the Tidal Energies project on the Normandy coast was suddenly dropped because it wasn’t profitable–not enough customers. This is symptomatic of what is wrong with the current government. Major new industrial projects are almost never profitable at first, which is why they need government support and subsidies to get going, with a view to the future. Such projects were supported under de Gaulle, raising France to the status of major industrial power, and providing unprecedented prosperity for the population as a whole. But the Macron government is not investing in the future nor doing anything to preserve industries that remain. The key French energy corporation Alstom was sold to General Electric under his watch. Indeed, it is perfectly hypocritical to call the French gas tax an “ecotax” since the returns from a genuine ecotax would be invested to develop clean energies–such as tidal power plants. Rather, the benefits are earmarked to balance the budget, that is, to serve the government debt. The Macronian gas tax is just another austerity measure–along with cutting back public services and “selling the family jewels”, that is, selling potential money-makers like Alstom, port facilities and the Paris airports. I’m more worried about the end of the month than about the end of the world. 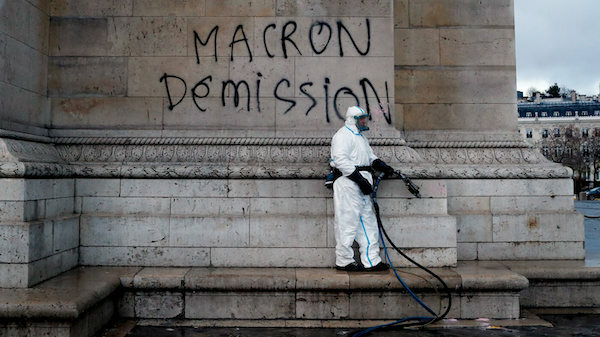 After the second Yellow Vest Saturday, November 25, which saw more demonstrators and more tear gas, the Minister in charge of the budget, Gérard Darmanin, declared that what had demonstrated on the Champs-Elysée was “la peste brune”, the brown plague, meaning fascists. (For those who enjoy excoriating the French as racist, it should be noted that Darmanin is of Algerian working class origins). This remark caused an uproar of indignation that revealed just how great is public sympathy for the movement–over 70% approval by latest polls, even after uncontrolled vandalism. Macron’s Minister of the Interior, Christophe Castaner, was obliged to declare that government communication had been badly managed. Of course, that is the familiar technocratic excuse: we are always right, but it is all a matter of our “communication”, not of the facts on the ground. Maybe I have missed something, but of the many interviews I have listened to, I have not heard one word that would fall into the categories of “far right”, much less “fascism”–or even that indicated any particular preference in regard to political parties. These people are wholly concerned with concrete practical issues. Not a whiff of ideology–remarkable in Paris! This is why cutting expenses and balancing the budget is his obsession. Because that’s what he was chosen to do by the oligarchy that sponsored his candidacy. He was chosen by the financial oligarchy above all to save the European Union from threatening disintegration caused by the euro. The treaties establishing the EU and above all the common currency, the euro, have created an imbalance between member states that is unsustainable. The irony is that previous French governments, starting with Mitterrand, are largely responsible for this state of affairs. In a desperate and technically ill-examined effort to keep newly unified Germany from becoming the dominant power in Europe, the French insisted on binding Germany to France by a common currency. Reluctantly, the Germans agreed to the euro–but only on German terms. The result is that Germany has become the unwilling creditor of equally unwilling EU member states, Italy, Spain, Portugal and of course, ruined Greece. The financial gap between Germany and its southern neighbors keeps expanding, which causes ill will on all sides. A nd yet, support for the Yellow Vests remains high, probably because people are able to distinguish between those grieved citizens and the vandals who love to wreak destruction for its own sake. So what next? Despite having been sidelined by Macron’s electoral victory in 2017, politicians of all hews are trying to recuperate the movement–but discreetly, because the Gilets Jaunes have made clear their distrust of all politicians. This is not a movement that seeks to take power. It simply seeks redress of its grievances. The government should have listened in the first place, accepted discussions and compromise. This gets more difficult as time goes on, but nothing is impossible. Diana Johnstone is the author of Fools’ Crusade: Yugoslavia, NATO, and Western Delusions. Her new book is Queen of Chaos: the Misadventures of Hillary Clinton. The memoirs of Diana Johnstone’s father Paul H. Johnstone, From MAD to Madness, was published by Clarity Press, with her commentary. She can be reached at diana.johnstone@wanadoo.fr.